Hurrah, the latest book is ready and YOU can grab it free for a limited time only! I know some people find it really taxing to take their kids out to places like galleries and museums, they worry that the kids are going to play up, get sticky fingers everywhere and quite possible trash a work of art. You know what kind of work I turn out by now, sensible, do-able, no-nonsense, easy steps to make everything run more smoothly. And of course I had to throw in some freebies so there are 2 sets of art cards and an art gallery printable booklet included! 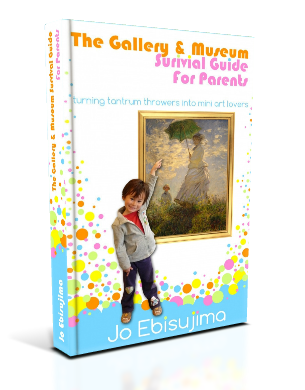 We love visiting museums and galleries and want other kids to enjoy it just as much, it really doesn't have to be hard work, boring or tedious. With some basic guidelines and a good handful of fun games you will notice a big difference in your trips out. Now, I know this is a bit cheeky but I figured you must like me or you wouldn't be here! So could you give me a hand getting the world out about my new book? Don't worry, it's totally painless. And of course, use the Facebook and other social media buttons freely! After all that work you deserve a treat - how about a free copy of the new book! This is the kindle version, if you don't have a kindle DON'T PANIC! You can still read it on other devices, just click here to download the free app to whichever device you prefer. A paper version will follow shortly.